Make the most of your Kyoto trip with our Kyoto itineraries for visits lasting 1 day, 2 days, 3 days, 4 days and 5 days, plus tailored Kyoto itineraries for Shoppers, Temple Lovers, Hikers and Garden Lovers, as well as off-the-beaten track, foliage and cherry blossom itineraries. If you’ve got only one full day in the city, you’ll want to see some of the most stunning and memorable spots. This itinerary includes the all-important Southern Higashiyama Sightseeing District, Downtown Kyoto, and the incredible Fushimi-Inari-Taisha Shrine, with it’s arcades of vermillion torii gates. Two days is enough to get a good taste of what Kyoto has to offer (and to whet your appetite for more). This itinerary covers the same sights as our one-day itinerary (above) and then adds the western sightseeing district of Arashiyama, with its famous bamboo forest, and two other western Kyoto sights: Kinkaku-ji Temple and Daitoku-ji Temple. Three days allows you to slow down and check out some off-the-beaten-track parts of Kyoto. The first two days of this itinerary are the same as our two-day itinerary (above) and then adds a half-day trip up to the mountain temple of Kurama-dera, and a few sights in the less visited Northern Higashiyama area. Five days is the perfect amount of time to spend in Kyoto. The first three days of this itinerary are the same as our three-day itinerary (above) and then adds a daytrip to nearby Nara and a day for activities like Zen meditation or tea ceremony. Want to visit all the must see Kyoto sights in one day? Here’s a step by step itinerary to help you get to all of Kyoto’s must see places in one day if you’re pressed for time. Iconic Kyoto sights in this itinerary include Kinkaku-ji Temple (the “Golden Pavilion”), Kiyomizu-dera Temple and the epic Fushimi-Inari-Taisha Shrine. Our itineraries for families traveling with children are designed to keep the children entertained while the adults get to enjoy some of the best sights in the city. They also take into account the challenges of getting around with children in tow. If you want to sample some incredible food, check out some brilliant markets and learn about Kyoto cuisine as you go, then this special one-day foodie itinerary is for you. This shopper’s itinerary lists the best and most interesting shops in the city. It’s divided by area so you can visit them efficiently and easily. This itinerary includes our favorite temples in the city, all divided by area so you can easily move from one to the next. Kyoto is a garden lover’s paradise. This itinerary lists the very best gardens in the city, conveniently divided by district, to make getting around easy. Kyoto is surrounded by mountains that are covered with hiking trails. Our Kyoto Hiker’s Itinerary page lists the five best hikes in or near Kyoto. If you really want to explore the city on foot, without taking any form of transport, you’ll love the three itineraries listed on this page. They cover the main sightseeing districts of Southern Higashiyama, Northern Higashiyama and Arashiyama. This two-day itinerary covers the very best cherry blossom spots in the city. Kyoto’s best fall foliage spots are all covered in this two-day itinerary. If you don’t like crowds, you’ll love the two walking itineraries on this page. They cover secret places in Northern and Southern Higashiyama. 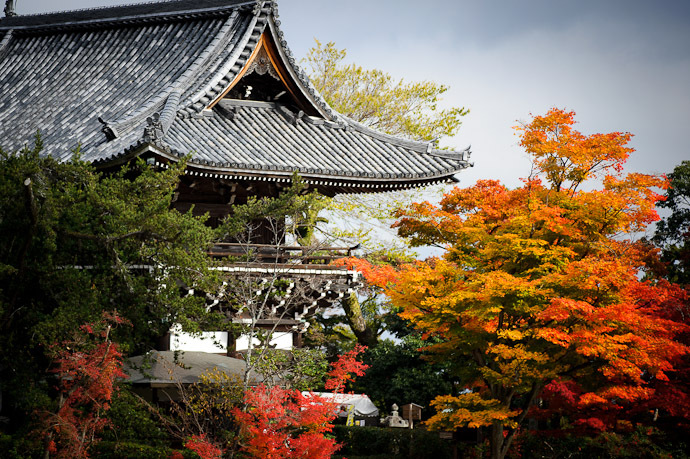 Kyoto is crowded during fall foliage season. To enjoy the colors away from the crowds, check out this itinerary. Sure, the cherries are beautiful, but the crowds are not. If you want to enjoy the cherry blossoms without all the people, check out this itinerary. For itineraries that cover all of Japan, ranging from a few days to two weeks or more, visit our Japan Itineraries page. 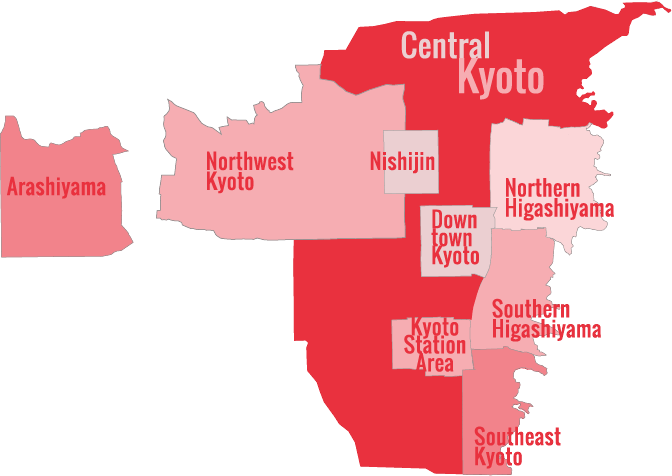 It’s important to think about your hotel location for making the most of your time in Kyoto. See Where To Stay In Kyoto for a rundown of the most convenient Kyoto districts for sightseeing.